"Mary Beth Latham is first and foremost a mother, whose three teenaged children come first, before her career as a landscape gardener, or even her life as the wife of a doctor. Caring for her family and preserving their everyday life is paramount. And so, when one of her sons, Max, becomes depressed, Mary Beth becomes focused on him, and is blindsided by a shocking act of violence. What happens afterwards is a testament to the power of a woman’s love and determination, and to the invisible line of hope and healing that connects one human being with another. Every Last One is a novel about facing every last one of the the things we fear most, about finding ways to navigate a road we never intended to travel, to live a life we never dreamed we’d have to live but must be brave enough to try." PLUS: Check out my giveaway of The Murderer's Daughters, a previous WOW pick, in the post below! I didn't know she had a new book, thanks! I will be adding this one to my growing list! That sounds great and I just love the cover! Here's my pick for the week. 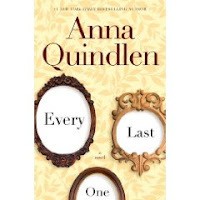 OMG, I love Anna Quindlen's books, and it's been ages since I've gotten my hands on one. I'm going over to pre-order it! What a lovely cover.Premise of the book is really good. I've somehow never read any of Anna Quindlen's fiction, even though I enjoy her articles and A Short Guide To A Happy Life. I really need to correct that oversight. I didn't know Quindlen had a new one coming out. Thanks! I don't have one this week, but my TBR stacks are already over flowing! Never heard of this author before...sounds like another one to watch out for. Love the cover on yours - hope you enjoy it..
Great pick! I've got one already published, and one coming out in March over at The Crowded Leaf. I really enjoy her books. Here is mine for the week, have a great day! Wow, you all start early. This one sounds like a tear-jerker. Sounds like a good one today. Mine is up! I haven't heard of this one...I'm adding it to my wish list! Anna Quindlen's new book sounds great. I wasn't fond of Rise & Shine and couldn't finish it but this sounds very good. Great pick! I've actually never read anything by this author. This weeks WOW is "A Match Made in High School", plus an interview with the author Kristin Walker. Every Last One sounds like an intense book! Great choice! I had no idea she had a new book. I chose Forbidden Game by LJ Smith. That sounds like a great read! Hope you don't mind me joining in to...here's my choice this week. I have not read any of her novels before, but this one looks really good. Thanks for sharing it. I hadn't heard of that one, sounds good. My WOW is a pick that actually came out on Wednesday, so I hope it still counts :) It's a sci-fi novel by the great Connie Willis! Thanks for hosting such a cool blog event. IV NOT HEARD OF THESE BEFORE..